I had my second appointment with my nutritionist. She ran another Zyto scan to see how my body was responding to the dietary changes I had made and the supplements I had been taking. Overall, I’m doing really well, but there are still some instances where gluten and other food stressors are popping up in my diet, so I have to be more careful, especially when dining out. What I’m learning through all of this is that making food is the best way to ensure I’m getting what I need (and what I don’t). She had me track my food the past couple weeks, and by bringing that in she was able to point out areas for improvement and show me how certain foods may be affecting my progress. It’s so nice to have someone there to guide me because all these dietary changes can be tricky to navigate. I’m going to start seeing a therapist. Unfortunately I don’t feel like I have healed a whole lot emotionally. I feel sad and angry most of the time. I’m probably my most “happiest” when I am at work where I’m distracted. Where I am two months post-loss this time around in comparison to where I was two months post-loss the first time is VERY different. I don’t feel that hope or happiness. I feel stuck, like there’s a barrier between me and being happy/hopeful again that I can’t seem to push through. I have finally decided that I am going to start seeing a therapist to work through all the emotional stuff. I’ve actually considered seeing a therapist for quite some time but was discouraged by the lack of clarity on coverage from my health insurance as well as the financial aspect. The process of finding someone and scheduling an appointment is the hardest part for me. Luckily, I had Dani guide me through the whole process. She has a degree in psychology, is planning on becoming a therapist, knows the industry, so she knew exactly what I needed to do and say. I reached out to a couple therapists and have an appointment scheduled with one next week. I really think this is going to be one of the best things for me. I feel like some emotional weight has been lifted just by knowing I’m going to be able to talk to someone about my issues. I had my appointment with my new OBGYN and got more testing done. Last week I met with my new OBGYN. I got a really good vibe, and I feel like I am in good hands with someone that is going to take my situation seriously. He sent me out for more testing which was oh-so-fun (sarcasm) because I ended up getting 16 vials of blood drawn in total. It would have been more if I hadn’t already done the other blood work with my PCP. 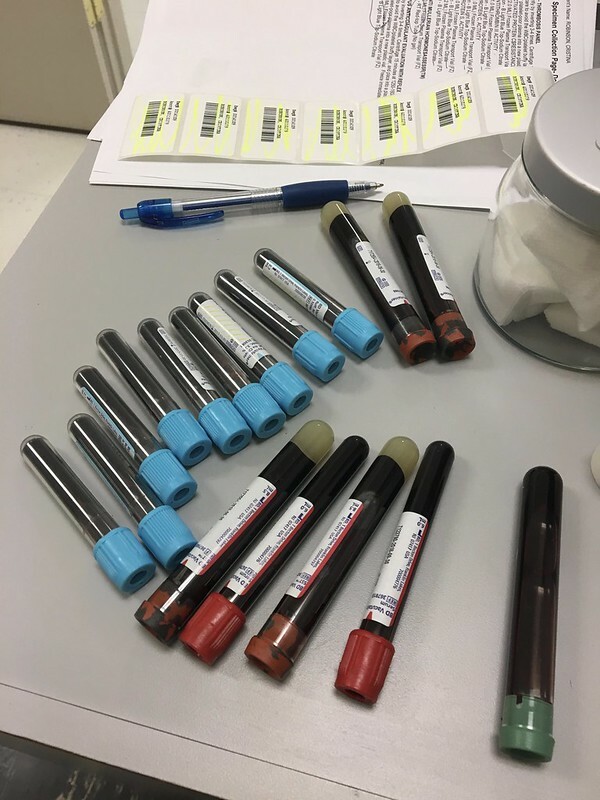 I got tested for clotting disorders, autoimmune, and various hormones to see how my PCOS is doing. In addition to all of that, he also ordered genetic karyotyping on Joshua and I, so Joshua only had to get one vial of blood drawn. Even though the doctor who performed the D&E did chromosomal testing on the fetus and everything came back normal, my new OBGYN said there are some results that may provide a false negative which is why he’s doing the karyotyping on us. We’ll get the results of the test in about a month, and based on what those results reveal we’ll put together a plan. My next appointment is in October. He also gave me the go-ahead to go back on my Metformin again, so hopefully that along with the dietary changes I’ve made will help move the needle on my weight. I’ve actually been put on a forced baby making hiatus for 3 months since the end of July because I was diagnosed with simple hyperplasia. My first fertility appointment is also in October and we will see if there is any improvement so that we can try again. It’s the waiting that’s so hard. Like you, I am working with a nutritionist. I’m not insulin resistant yet but I need to lose weigh to minimalize the amount of estrogen I produce. Here’s to hoping that we both see some improvements by our next appointments, mentally and physically.